Once kids have a solid grasp of CVC words, they are ready to tackle blends, digraphs, and even CVCe words! 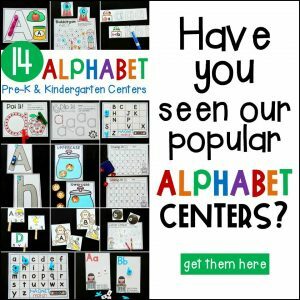 “Magic E” words, or words where the “e” at the end makes the vowel long, are a great introduction to long vowels and building up fluency in early readers. 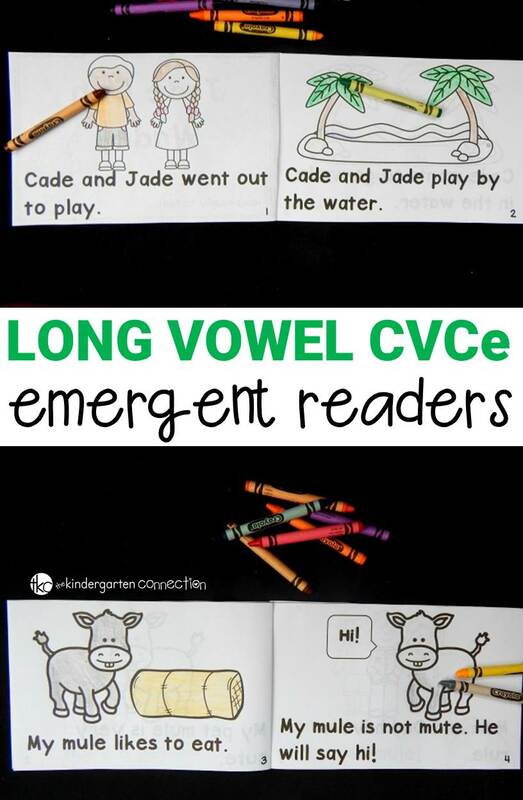 These 17 emergent readers focus on CVCe word families and give kids fun, interactive practice! 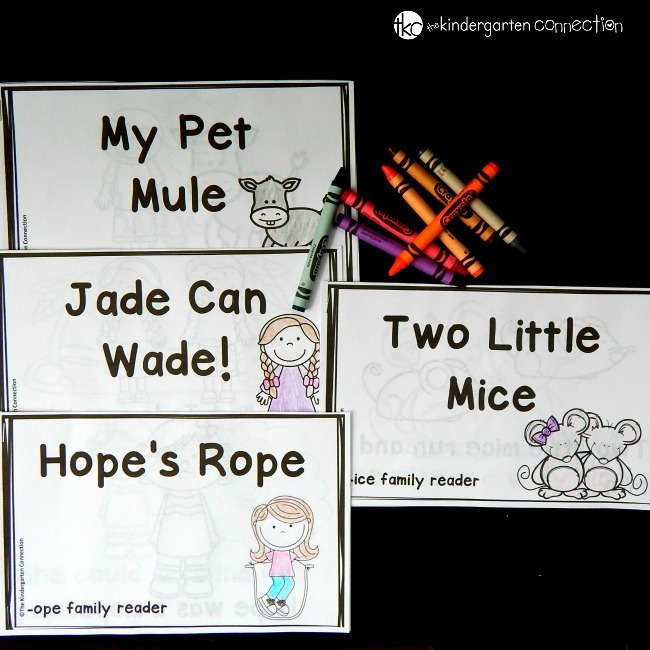 Just like our other emergent readers, these books are super easy to prepare. Simply print two sided, cut in half, staple, and that’s it! You now have two books ready to go! I love to print these books out whenever we are working on a new word family or spelling pattern, as each one focuses on a CVCe word family. They are great for small groups because we practice and work on the book together, then I can send it home for them to keep and practice there as well! When we first use the books, we take a picture walk to see if we can find clues as to what it is about. Then, we identify the word family, which is on the front cover of each, and go through the book to hunt and highlight words in that family. This is optional of course, but I find it really helpful for helping kids notice the CVCe pattern. 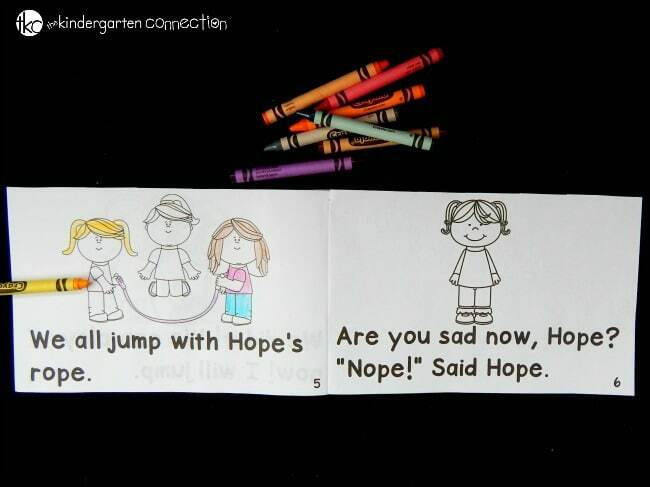 We also do this with our phonics poems, and it is so beneficial. Then, we are ready to read! We practice the books several time to build up our fluency. Each book contains sight words as well, which is helpful for kids, as they are often words they are working on and need more exposure to. Finally, after we have read the book and practiced the word families, we spend a bit of time coloring! 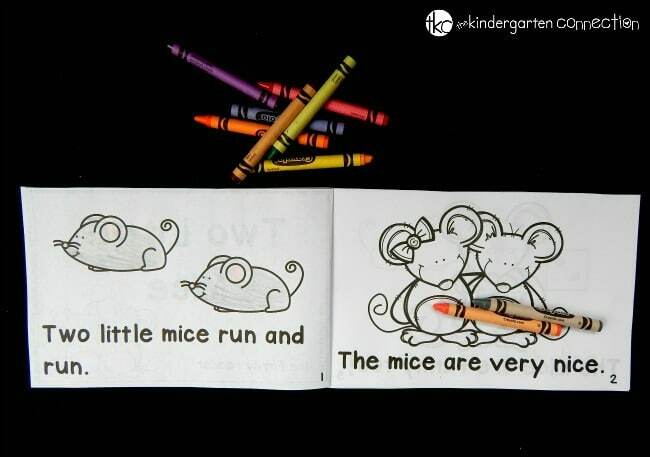 My kids love being able to color some of the book at school, and what they don’t finish they can do at home or later in the day. It makes them have more ownership over the book as they get to make it more their own! Ready to read CVCe words and build up reading fluency? 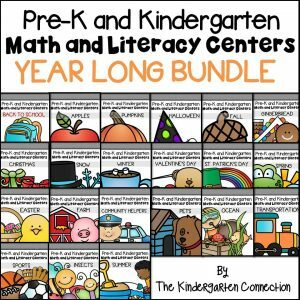 You can grab these 17 emergent readers in our TpT store HERE. 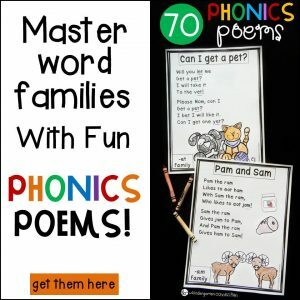 Want more than just long vowels? We have over 100 books ready to download instantly in our Emergent Readers Mega Bundle! 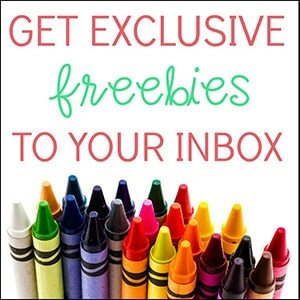 We have tons of books, including some fun and free ones here on the site like our emotions emergent reader, rainbow emergent reader, and our popular dinosaur emergent reader!